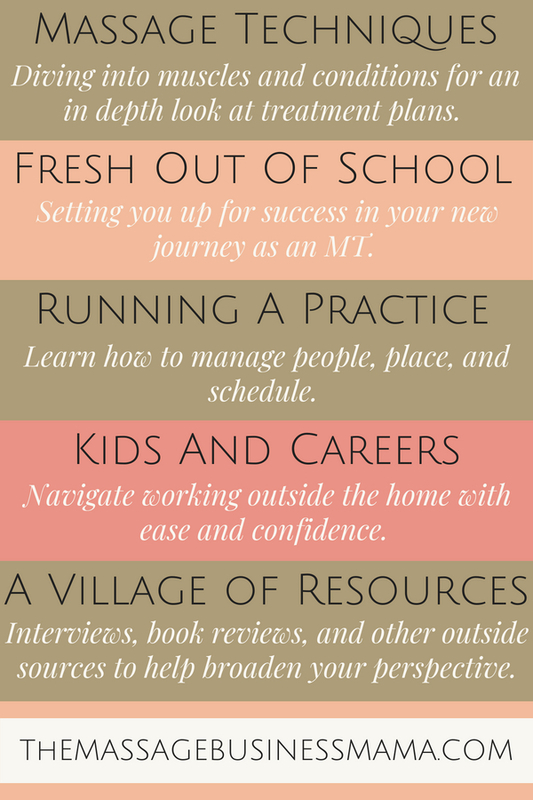 In this Post: Learn tips and tools for working while pregnant as a Massage Therapist. When I first discovered I was pregnant, my brain went into high gear! I got a little sweaty and questions started pouring into my mind! Among those were, how would my massage work look? Would I have the stamina to work until the end of my pregnancy? How would I feel when giving massages? Would my clients hesitate to come to see me while I was pregnant? And the biggie, financially would I be able to pull it off? Pregnancy is an exciting and scary time! There are so many unknowns! It is only natural to ponder questions related to the health and well being of the baby, logistics of setting up a nursery, and how your relationship with your job will change. It’s a good thing we have 9 months to work through all these things in our head! As you know, every pregnancy is different! Some women have morning sickness, some don’t. Others have wicked bad heartburn, others don’t. Some unfortunate women, like my sister, have to be on bedrest for the majority of their pregnancy. I can only imagine how trying emotionally and physically this might be! As you start to figure out how your pregnancy will impact your massage career, know that just like all things in pregnancy there are no hard and fast rule. ALL WOMEN ARE DIFFERENT! This is good. This is what keeps life interesting! 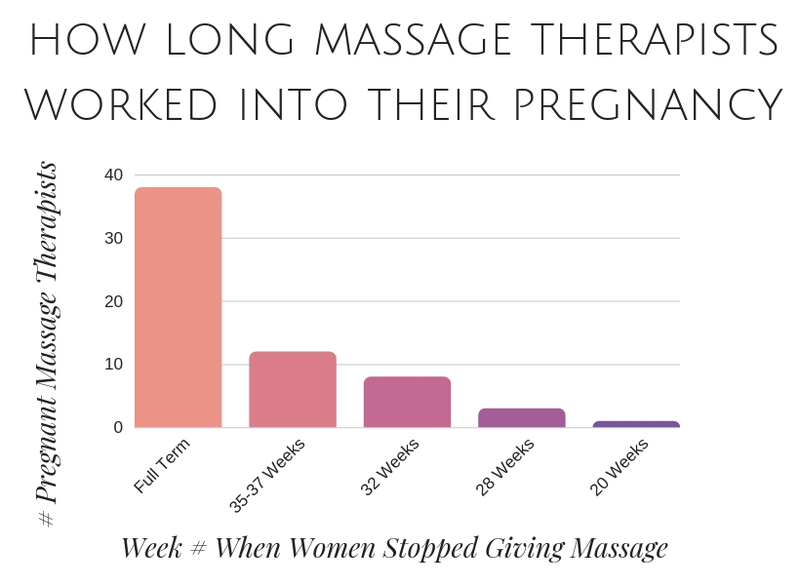 At what point during your pregnancy should you stop giving massage? This is a question I commonly see asked. You may be wondering this yourself. I understand, you want to plan as much as humanly possible before your life is altered forever! Some women begin to show and get quite uncomfortable early in their pregnancy, while others have relatively easy pregnancies and don’t begin to show until the very end. Some women are severally fatigued while others claim to feel better than any other time in their life. So what about an average? The graph below shows the results of a Facebook poll I conducted of 62 massage therapists who worked during their pregnancy. As you can see many of these women worked until right up to giving birth. While some women recommend this so that you can spend more time away from work after your child is born, others suggest giving yourself a little bit of a break before your babe arrives. Personally, my intention was to take 16 days off before my son arrived. My last day of work was scheduled to be 17 days prior to his due date. He had other plans and came the last day I was scheduled to work. I agree with the women who say it would have been nice to have a little bit of time to nest, prep some freezer meals, sleep, and organize the nursery. But life had other things planned for me. If it is your desire to work until the last possible moment, know that there are ways to lessen the impact on your body. With a few adjustments, you very well could give a good massage until right before you give birth. Again, not every woman has this capability, but many do. Schedule a little bit more time than usual between sessions. This will give you time to take care of yourself. You will be eating more, and thus need frequent snack and lunch breaks. If you have morning sickness, you may be spending time praying to the porcelain goddess, account for this in your breaks. I even scheduled “Nap Time in My Outback” when I was pregnant. I chose to nap in my car to lessen naptime interruptions. Sometimes 10 minutes to rest my eyes was all it took to rejuvenate me. Pay attention to what your body is telling you. If you need to drop your client load for a while, so be it. It may just be during certain stages that you have to reduce the number of clients you see. Many women, (me, me, me), are severely fatigued during their first trimester but then regain their regular energy during their second trimester. Listen to what is going on with your own body to determine the right steps to take. Wearing compression socks have many health benefits when you are pregnant. They prevent blood from pooling and help mother and child from developing elevated heart rates. Compression socks can also reduce the risk of varicose veins, phlebitis, and thrombosis. Medical professionals recommend wearing these stockings well after pregnancy when you work a job that requires you to stand for long periods of time. You may find yourself sticking with this practice after having your child. Your happy legs will thank you! There are many parts of the body that you can massage from a seated position. Switching up your routine to incorporate more work from a seated position can give your body the rest it needs in order to perform longer into your pregnancy. A lower table height will accommodate your growing belly. There still may be times your stomach brushes up against your client, but they will be fewer if you drop it down a notch or two. As long as you aren’t resting your belly on your clients, they will understand. With a heightened sense of smell, things like body odor that never used to affect you may have a huge effect on your gag reflex. Having a bottle opened and ready to go, for that client with the offensive aroma, will save you! Trust me, I had to dab oil under my nose several times to make it through the hour with the guy who didn’t shower after the gym, or the women who came straight from the ski slope. Many women run extremely hot during their pregnancy. If you wear layers, you can strip down to your tank top if need be. Anytime that I end up massaging in a tank top, I typically like to cover back up before my client exits the room. Here reveals my emphasis on the importance of being modest as massage therapists. I take this very seriously! More on that in a different post though. Wearing a belly band can reduce pain and improve posture. These clever little pieces are extremely helpful for massage therapists. I would recommend using one that does not have velcro, as I found the velcro ones were a bit noisy in a quiet massage setting. If you plan on working until the bitter end, it will be no shock to your clients that you may have to cancel an appointment. Make sure to explain to them what they can expect if/when you do go into labor. Will you have your husband or friend calling clients to cancel? Or will you send an email? Whatever option you go with, be crystal clear as to what they can expect. Any time I am not 100% myself, whether that be due to injury, an emotional situation, or pregnancy I am always a little reluctant to share too much with my clients. I don’t want my clients to feel “bad” for coming to me when I am going through difficult times. Because of this, I tend to downplay a lot of what goes on in my life. To financially support myself, I need my clients to come to me regardless of whether or not my grandma just died. Pregnancy for me was no different. Obviously, I didn’t hide the fact that I was pregnant. But I did try to not dwell on the harder aspects of my pregnancy. I refrained from talking about my awful heartburn and acute sense of smell. Another reason I like to downplay these type of events in my life is that I try to give a client-centered massage. For me client-centered massage is time that is dedicated to what is going on with my clients, not myself! This is hard at times. The bonds we develop with our clients run deep. But if I can go back mentally and hold space for my client’s chief complaint, I am usually able to direct the conversation and energy away from myself and back towards their needs. Working as a massage therapist while pregnant can be a challenging thing. Hopefully some of the suggestions above will help you tackle this adventure with a little more ease. Once again remember that every woman has different challenges during their pregnancy, and the most important thing is to listen to what your body is telling you! What tips and tools have helped you massage during your pregnancy? Please share in the comments below!